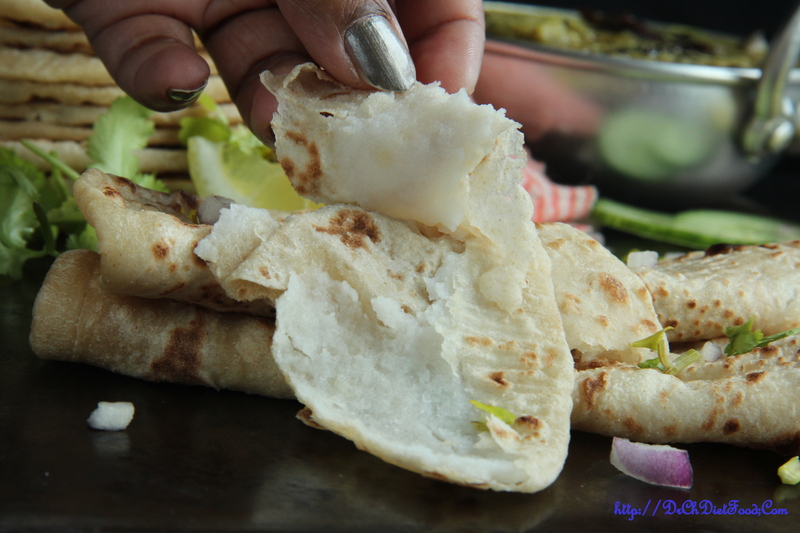 But here in this recipe it’s the fusion of Rice roti and Chapathi where the rice flour dumpling is stuffed in wheat dough and cooked as chapathi. It’s an easy morning breakfast or even can be packed with tiffin. 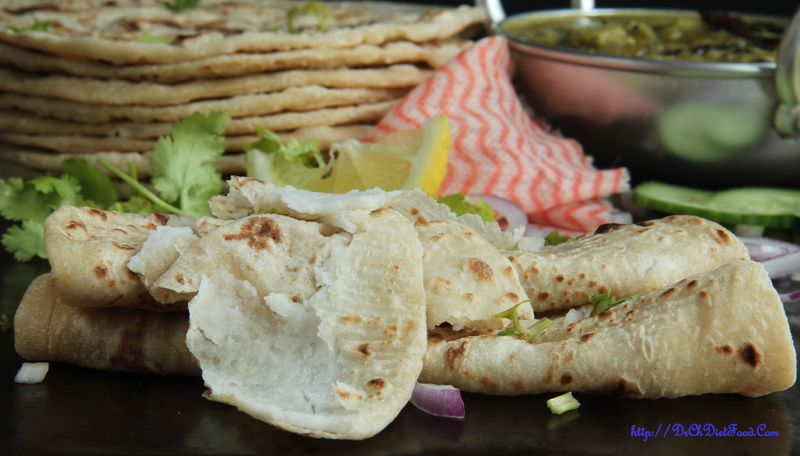 These chapathi taste best with eggplant dip or alternatively you can try with fresh pickles like ginger chilly pickle. In a mixing bowl mix the wheat flour, salt and add water little at a time until it forms a dough. Then knead into a smooth dough and wrap with a cling film/kitchen towel and let it rest for 15-20 minutes. Bring water to boil in a medium saucepan, when the water just begins to boil, add in rice flour, salt, oil and stir with a spatula. 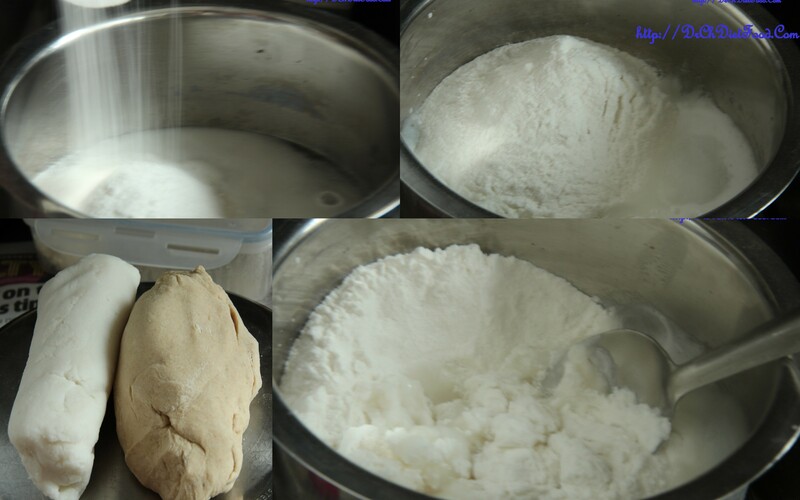 Once the water and rice flour are well mixed, just let the dough cool a bit. 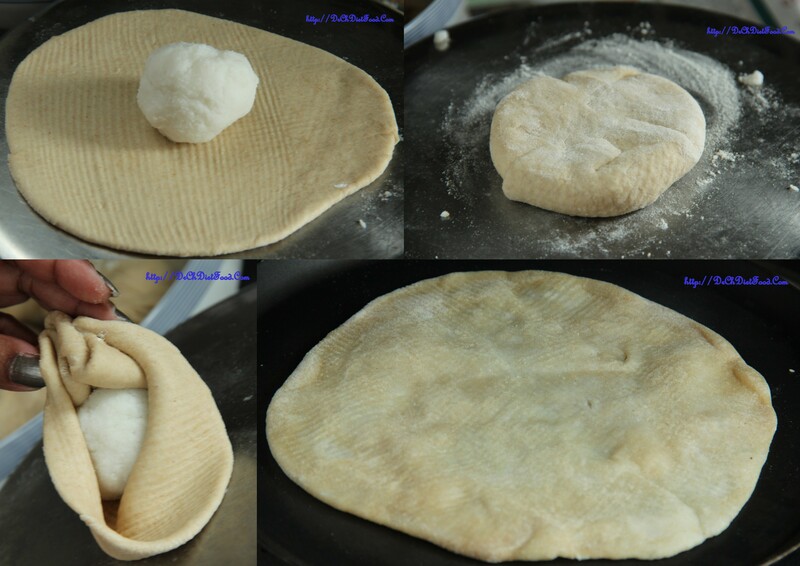 Once the dough is warm enough to handle knead it nicely like a chapathi dough. Make a lemon sized balls , keep covered and set aside. After resting time of the dough divide into equal portions. Take one portion of the dough ball and on the dusted board roll to a small disc about 3-3.5 inches in diameter. Place one portion of the stuffing , bring the edges together seal and flatten it in the centre. Roll again on by dusting some flour to approx. 5-6 inch diameter. Cook on a hot tawa/pan by brushing some oil both sides until golden brown spots appears. 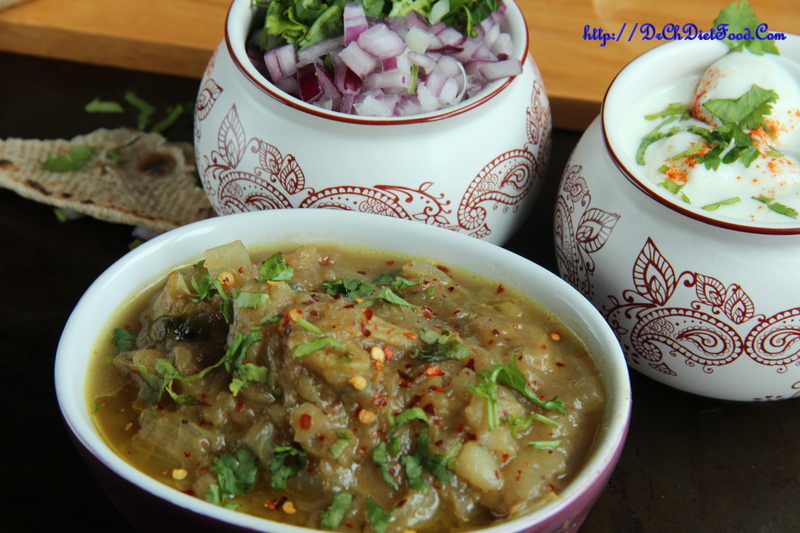 Posted on May 4, 2015, in Indian, Main dish. Bookmark the permalink. 28 Comments. This looks incredible! 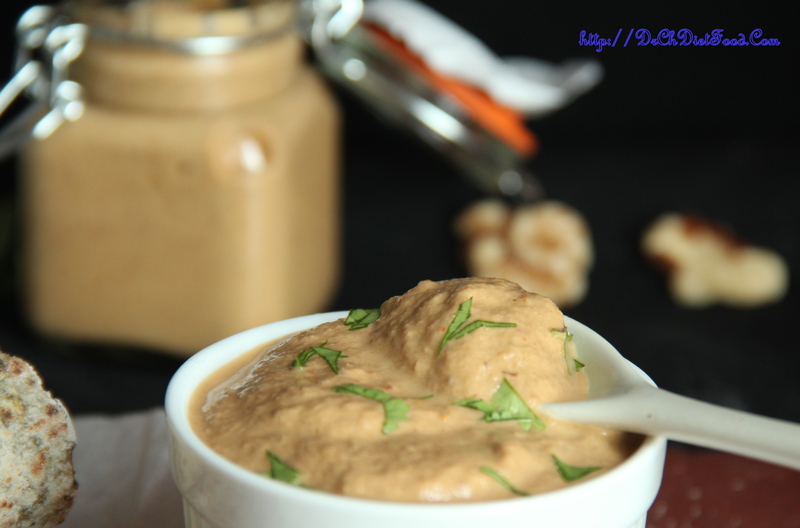 That tomato walnut dip, though! Amazing! Wow, lovely!!! Quite unusual and interesting…Must be delicious! Oooh this sounds both delicious and fun to eat. Thanks for the dip and other side ideas too. Hugs. Wow. I love roti. Thank you for teaching us. This is often seen in China, too. Tastes good! Great cook blog.l will follow to read your new recipes. Best regards. 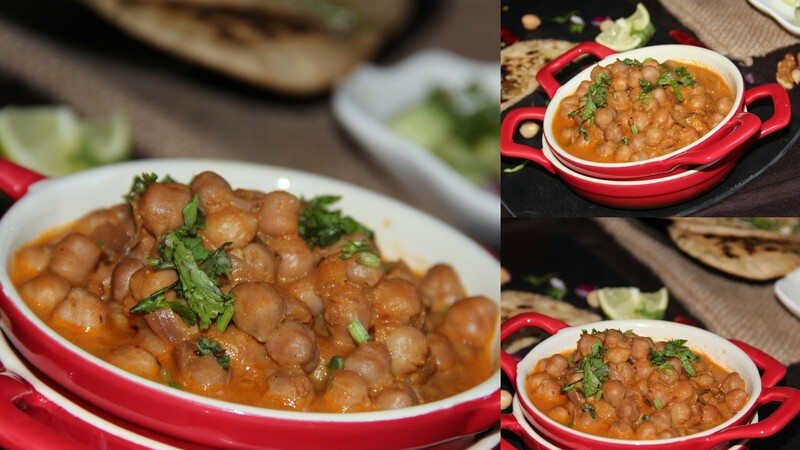 Great cook blog.Thank you for visiting my blog.Warm regards.